The ad features six of the Republican's siblings. Most political ads follow a familiar formula: tout accomplishments, public testimonials and wrap with the mandatory message of endorsement. Arizona congressional candidate David Brill's ad is no different -- until those criticizing his opponent reveal their last names. Brill is embroiled in a contentious fight against incumbent Rep. Paul Gosar, who represents Arizona's 4th Congressional District. But he won't for much longer if his siblings have anything to say about it. Brill unveiled a stunning campaign ad on Friday in which Gosar's own brothers and sisters come out in support of the Democrat -- six of them. The ad seems like a run-of-the-mill spot, with six Arizonans knocking Gosar's bonafides and calling for voters to support Brill. "Paul Gosar the congressman isn't doing anything to support rural America," says Grace, touted as simply a rural physician, as the ad opens. "Paul's absolutely not working for his district," David, lawyer, says. "If he actually cared about people in rural Arizona, I bet he'd be fighting for Social Security, for better access to health care, I bet he would be researching what is the most insightful water policy to help the environment of Arizona sustain itself and be successful," says Jennifer, a medical interpreter. It's only at the end that the ad reveals these surname-less people are actually Gosar's siblings. In addition to Grace, David and Jennifer, Gosar's other siblings -- Joan, Tim and Gaston -- also appear in the ad. Gosar has nine siblings, with three not appearing in the ad. 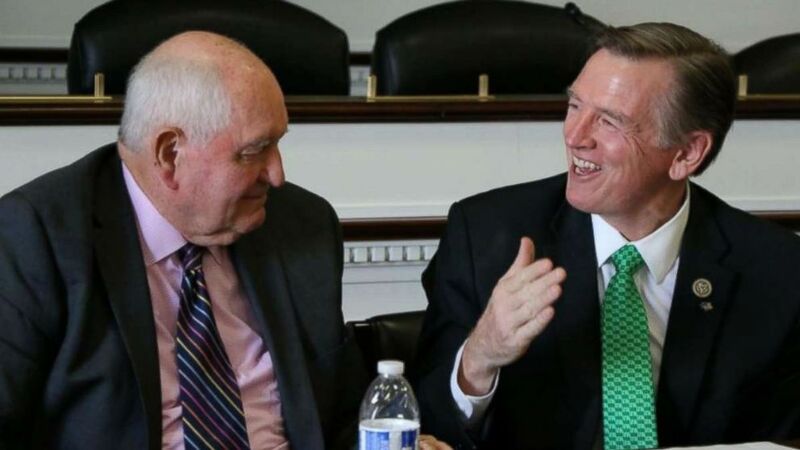 (Twitter/@westerncaucus) Rep. Paul Gosar, right, is joined by Secretary of Agriculture Sonny Perdue at a Western Caucus monthly meeting on Thursday, Sept. 6, 2018. The congressman responded to the attack ad on Saturday in a string of tweets, saying, "Not one of my siblings lives in Arizona and my opponent's policies are out of sync with what Arizona wants and the country needs. I will not be deterred from fighting for our conservative values regardless of these attacks." You can’t pick your family. We all have crazy aunts and relatives etc and my family is no different. I hope they find peace in their hearts and let go all the hate. He also touted that his mother endorsed him in an interview with The New York Times, to which he responded: "I guess I really am Mom’s favorite!" Gosar, 59, has represented the 4th District since 2013 and represented the 1st Congressional District for one term before that. He's made a host of controversial comments over the past few years. Following the death of counterprotester Heather Heyer during a white nationalist rally in Charlottesville, Virginia, Gosar pushed the conspiracy theory that the riots were "created by the left" and billionaire George Soros in an interview with VICE News. He also said Soros, a Democratic fundraiser, collaborated with Nazis during World War II, a claim pushed by far-right pundit Alex Jones and InfoWars. Soros, and others, condemned the baseless accusation. Gosar also boycotted a speech to Congress by Pope Francis in 2015, the only congressman to do so, after penning an op-ed that called him a "leftist" and criticized his attention to climate change, which Gosar calls "questionable science" used to "guilt people into leftist policies." As House Western Caucus chairman, he has also taken a leading role in overhauling the Endangered Species Act.